Just like couples, wedding ceremonies come in all shapes and sizes. Truly, there is no right. And there is no wrong. For most couples, deciding on the size, shape and color of a ceremony ritual is a hugely personal decision. And over the years, I have been with couples of all paths and traditions – with guest lists from 2 to 400. 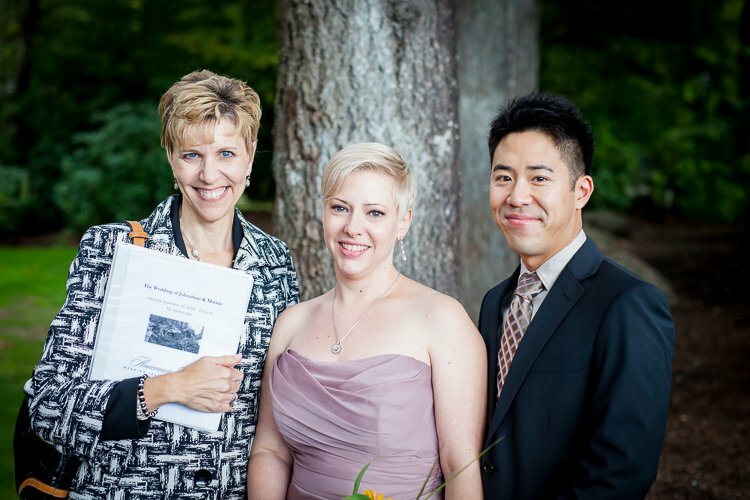 While many wedding ceremonies often have 40 – 100 guests (150 people is BIG in Seattle! ), I also love the tiny and intimate ceremony. On Saturday afternoon, John and Marnie were married at The Salish Lodge in Snoqualmie, with Marnie’s parents and two friends as guests/witnesses. What I love about John and Marnie and other couples who go this route is that they did things right. They were intentional about creating a beautiful ceremony and celebration that truly marked the moment. They were thoughtful in how their day was going to come together and this was reflected in the ease and grace of their wedding weekend. So, bottom line? For a tiny ceremony and celebration, go big. Not in terms of people present but rather in terms of planning a day or weekend that is truly a personal and intimate celebration and tribute to a loving relationship.